TENSIONS continue to simmer in the Black Sea region after Russia seized three Ukrainian naval vessels attempting to enter the Sea of Azov on November 25. The Sea of Azov is the world’s shallowest sea with a maximum depth of about 14 metres. Image: Britannica. Click to enlarge. At this stage, disruptions to the movement of grain have been minimal, but any escalation of the standoff could have much wider ramifications. The incident is a continuation of the issues that escalated after Russia annexed the Crimean Peninsula in 2014. Prior to this, Crimea existed as a semi-autonomous part of Ukraine, with political ties to Kyiv (Kiev) and strong cultural bonds to Moscow. The Sea of Azov, the shallowest sea in the world, is a small body of water whose only access to the open seas is the Kerch Strait which connects it to the Black Sea. This passage is only four kilometres wide, and is now spanned by a recently completed, and highly controversial, bridge linking Crimea to the Russian mainland. The sea is supplied by numerous rivers, the biggest of which are the Don and Kuban, which drain vast areas of southeastern Russia. As a result, there is an almost constant outflow of water into the Black Sea, and salinity is low. 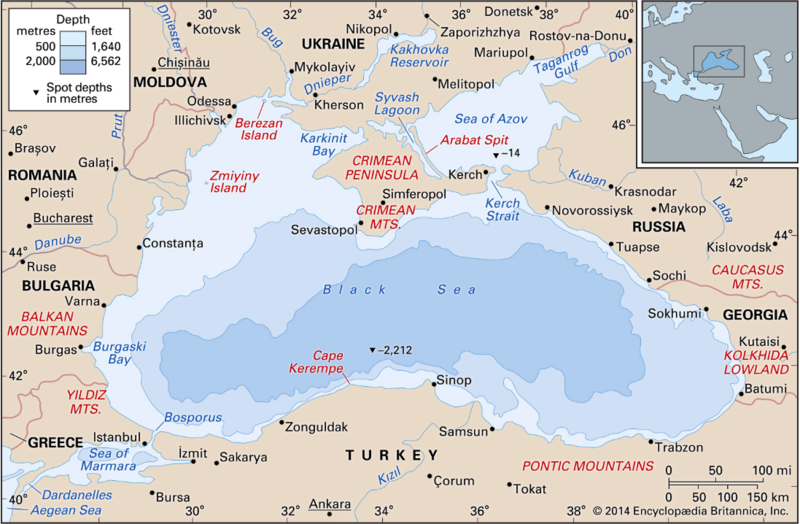 Under a treaty signed in 2003, the Sea of Azov is shared by Russia and Ukraine. Following the annexation of Crimea, the Kremlin effectively gained control over both sides of the Kerch bottleneck, despite the aggressive action not being recognised by the global community. Ukraine’s two major ports on the Sea of Azov are Mariupol and Berdyansk, and according to a government spokesman, they only make up about five per cent (pc) of the country’s grain exports. Around two million tonnes (Mt) of Ukraine grain exports were via the Kerch Strait last year. That said, it is likely that global trade will simply reduce Ukraine’s exposure to the current tensions by refusing supplies from the Azov Sea ports. However, the issue here is not the minor disruptions to grain movements via the Kerch Strait. It is the possibility of an escalation in the tensions jeopardising grain exports from the greater Black Sea region, in particular, Ukraine. As of 27 November, Ukraine’s total 2018 grain harvest had reached a record 68.2Mt. The corn harvest is reportedly 94pc complete, with 33Mt in the bin. As a result, exports are expected to reach an all-time high of 47Mt in the 2018-19 (July-June) marketing year. Kyiv has temporarily imposed martial law in parts of Ukraine as a result of the crisis. However, according to the country’s acting agriculture minister, the martial law was not currently affecting grain shipments from their Azov Sea ports, and they could be diverted to the country’s Black Sea ports if necessary. Nevertheless, this would increase the pressure on an already strained rail and road logistics network. There is some international concern that under the terms of martial law, Ukraine could commandeer trains from commercial users. This is reportedly prompting some international banks to reduce their exposure to Ukraine by threatening to cut commercial financing. Reports that Russia is building troops on its eastern border with Ukraine, and deploying more ground-to-air missiles on the Crimean Peninsula, will certainly not ease the strain on the already tense relationship. There is also the possibility that the European Union will add to the friction to the situation by increasing sanctions against the former Bolshevik state. While Putin’s actions would seem to be Russia’s way of demonstrating dominance over Crimea and the surrounding waters, neither country can really afford an all-out conflict. But then again, when has affordability, financial or political, ever got in the way of a good fight? Meanwhile, Don’s Party (US-China trade war) is on hold after Xi Jinping and Donald Trump reportedly declared a trade truce following their bilateral meeting at the G20 summit in Argentina over the weekend. It was the first time the pair had met since the world’s two largest economies had imposed tariffs on each other’s imports. Apparently “The Don” has agreed to delay the threatened imposition of 25pc tariffs, up from the current 10pc, on Chinese imports for a period of 90 days to allow time for negotiations on longstanding trade disputes. Not surprisingly, Trump took to Twitter and used one of his favourite words – amazing – to describe the meeting between the two leaders. According to a White House statement, China has agreed to resume the purchase of US agricultural products. This is a big boost to US Midwest soybean farmers, many of whom were Trump supporters at the last election. China is traditionally the biggest destination for US soybeans, but since the trade tensions escalated under the Trump administration, exports have been reduced to a trickle. To start the week, soybean, corn and wheat futures all opened higher on the Chicago Mercantile Exchange, reflecting the positive sentiment emanating from the G20 discussions. Nevertheless, actions from both parties will be the best market barometer over the next few months. China had been extremely quiet in the bean market leading into the summit. If the Chinese come shopping, the US will certainly be willing sellers, as stocks are plentiful following a huge harvest. The possibility of a record Brazilian harvest being available to the global export market around March next year will only increase their resolve. South American crop scouts are saying that Brazil has had its best start to the summer-cropping season for many years, and is expecting soybean production could be as high as 122Mt. The longer-term effect on the Aussie market will be interesting, particularly for sorghum. In recent years, Australia has been a big supplier into the Chinese market for production of the white spirit, baijiu. There is definitely no production certainty at the moment, but a big area has been sown, and if that culminates in a big harvest, then Australia will need to find export demand. Should China and the US solve their differences over the next three months, then US sorghum suddenly becomes a cheaper alternative when Australia is ready to export. This will be quite bearish for Aussie values, as sorghum is struggling to find significant feedlot demand at the current discount to domestic cereal prices. This article was written by Peter McMeekin who is consultant to Grain Brokers Australia.